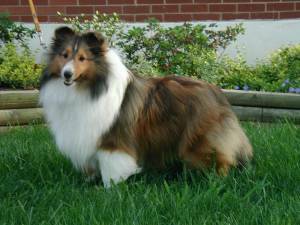 The Shetland Sheepdog comes in several colors with varying amounts of white and/or tan. 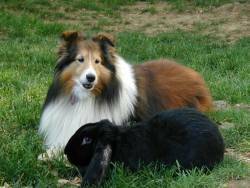 Sable is probably the most thought of color when someone thinks of a Sheltie. Sable is basically a brown dog with varying amounts of white. The sable can range from a pale golden to reddish to a deep mahogany - almost a black-brown. Tri Color is a black, white and tan Sheltie. The main color is black with varying amounts of white and tan. 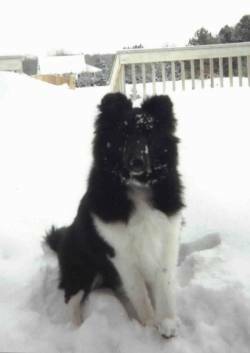 Bi-Black is a Black and White Sheltie - no tan. 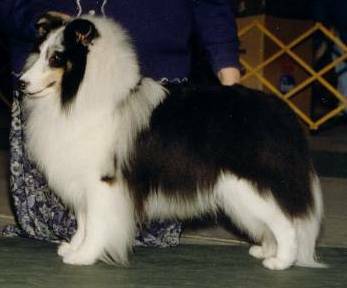 Blue Merle is a tri color dog that has a merling gene. Merling is incompletely dominant so only one gene needs to be carried to be expressed. Merling dilutes the black to gray and black mottling. Bi-Blue is a bi-black carrying a merling gene. Sable Merle is a sable carrying a merling gene. 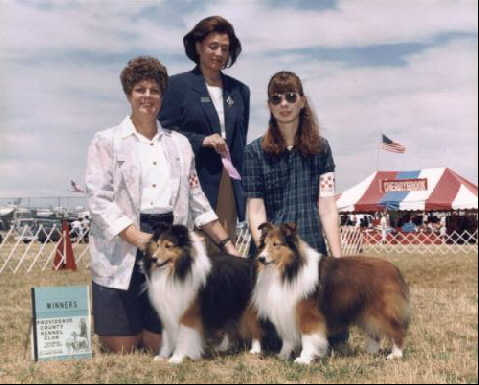 Unlike the blues, a sable merle is tougher to determine. Many grow up looking like a sable. Color Headed White is a pattern. This is a dog with a predominantly white body, coloring on the head and a splash or two of color on the body. If a CHW has too much color, it is a poorly marked dog. 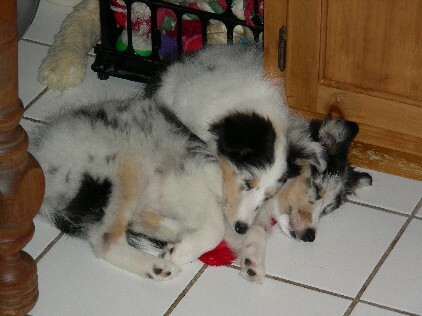 Though Shelties with more than 50% white are allowed for UKC Conformation, in the AKC they are seriously faulted. Double Merle White is what happens when two merles are bred together. Double merles are prone to vision and hearing problems of varying degrees. Breeding a merle to a merle should be discouraged. Scooter was a bi-black. Add tan in his face and legs and you would get a Tricolor like Chilly, below.